Grandpa has always had the best sense of humor. Celebrate fishing trips, little league games, and lifelong memories with our fun gifts for grandfathers. 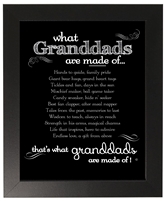 From cute signs to hang in his workshop or garage, to memory books and ornaments, we've created the perfect gifts with your grandfather in mind. 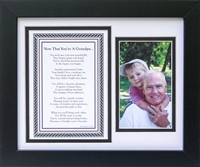 If you are looking for birthday gifts for grandpa, you can find cute cards and thoughtful poems that are sure to bring a smile to his face and make his day. Grandpa taught you so much about life and love. Soften grandpa's heart by letting him know you're thinking of him. A gift is a great way to show how much you care and give grandpa something to hold and cherish for years to come remembering the good times with his amazing family. We ship fast so get your grandpa the perfect gift to give him the next time you're together today. 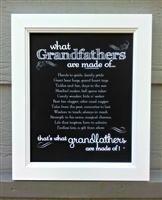 If he doesn't go by grandpa, see our Personalized Grandparent Gifts and add his own special name. Personalized FREE!